Table Designs has been providing custom restaurant table tops and table bases to the food service industry since 1992. Located in Tampa, Florida, our tabletops are made on-site by local craftsmen. We specialize in the manufacture of varnish, epoxy resin and ultraviolet cured finished tables. These highly durable, moisture and stain resistant, restaurant furniture is easy to clean and are exceptionally suitable for commercial food service applications. Digital printing is done on our Oce 350GT flat bed printer. This printer is white ink capable and can print full color directly onto tabletops as thick as 2”. Whether printing full bleed prints on fiberboard or full color logos on veneer, this printer can do it all. Digital images of veneers, posters, charts, photographs, fabrics and more can be created with our Paradigm ImagePro wide format scanner capable of 1200 dpi scans. Wood edge radius pieces and custom shapes and curves are cut on our MultiCam CNC router. This router will cut virtually any shape in solid wood, particleboard, fiberboard, plastic and metal. Veneers are cut into box and sunburst patterns with .0001 inch tolerance.Other equipment includes wide-belt sanders, panel saws, table saws, compressors, dust collectors, curing racks, spray guns, hand held routers and sanders and other tools too numerous to list. With our ImagePro 42” HD scanner we can scan your fabric, wallpaper, photograph, poster, nautical chart or virtually anything that is less than .5” thick and up to 42” wide. This scanner is capable of 600 DPI scans so image detail is indistinguishable from the original artwork. (42″ Wide x 120″ Long) or (48″ Wide x 96″ Long) or (60″ Wide x 60″ Long). 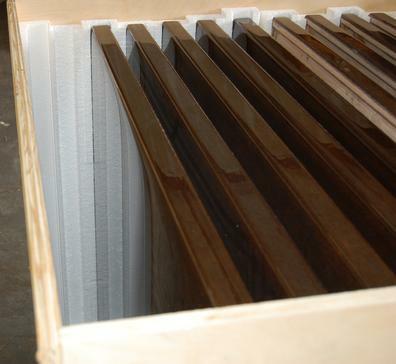 Most tables are shipped in plywood crates with styrofoam lining to ensure your tables arrive damage free. 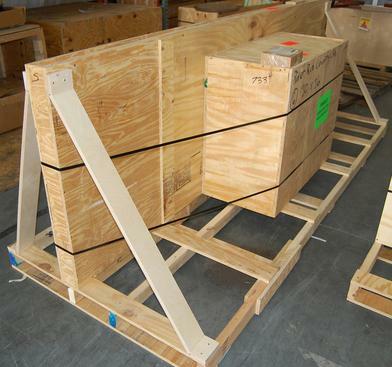 These crates are suitable for shipping internationally. We do ship worldwide.